Shirley Bassey was the daughter of a West Indian seaman and she grew up in Tiger Bay in South Wales. She began singing while still sixteen years old at the clubs in and around Cardiff. However, she found work in a touring show called "Memories Of Jolson" and from this moved on to further revues. She soon came to the attention of the impresario Jack Hylton who started her as a support act on Al Read's "Such Is Life" comedy show. Within a few months, she was topping the bill on ITV's "Sunday Night At The London Palladium" programme.. Her recording career began in the mid-1950s and she soon became a highly regarded British singer with her powerful renditions of popular songs. It seems improbable now, but her first chart success came with a cover version of 'The Banana Boat Song' which reached #8 despite the fact that Belafonte got to #2 with it. Her next big chart success 'Kiss Me Honey Honey Kiss Me' was also untypical of the work for which she would later become internationally recognised, although it was probably that record that drew public attention to the strength and beauty of her voice. In fact the song caused a resurgence of interest in her earlier single, 'As I Love You' which then went to #1. The EP illustrated on the right is one of very many bearing her name that were issued by Columbia during the early 1960s. 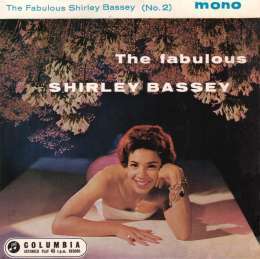 The songs on it were recorded in the company of the Geoff Love Orchestra which was one of several bands that Shirley worked with. As the sleeve notes on this particular example say: "Many are called 'fabulous' but few can really live up to the reputation". Certainly, it is an adjective that could be applied to Shirley Bassey without giving rise to too many disputes. Her success with singles began to fade towards the end of the sixties, but her popularity on LPs was undiminished and her breadth of fame increased through her work in the James Bond movies. She became a resident of Switzerland during the 1970s and later, supposedly, retired there. However, she still performs regularly if infrequently and remains one of the most glamorous and significant performers to have emerged from the UK entertainment industry.